A prayer for every season, for every day. This book of pocket prayers is a faithful companion on your journey of faith and encouragement. Wish there was a guide to daily life? Each year of life brings seasons of loneliness, doubt, joy, confusion, fear, reasons for celebration, and occasions for grieving. 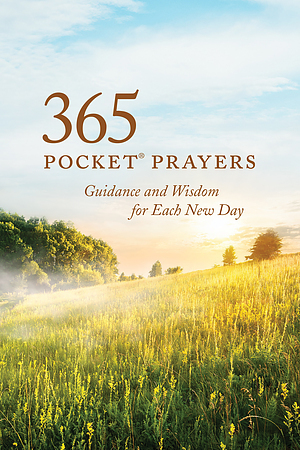 365 Pocket Prayers lets you grow closer to God with each passing day. With this convenient, easy-to-carry, quick-access prayer guide you will be able to express your hopes and heartaches to the God who listens in times both good and bad. Look for other books in the Pocket Prayers series from Tyndale. 365 Pocket Prayers by Ronald A. Beers was published by Tyndale House Publishers, Inc. in September 2018 and is our 2514th best seller. The ISBN for 365 Pocket Prayers is 9781496434500. Love this book. It has a prayer for every day of the year and they are very good prayers too. Very pleased with it. A beautiful book of pocket prayers. I bought it as a gift for somebody. And they are very pleased with it. I looked through it and liked it too. Got a question? No problem! Just click here to ask us about 365 Pocket Prayers.